The monumental Racine County Courthouse is the tallest building around. Published Nov. 13, 2018 at 9:03 a.m. This month, we visit our neighbor to the south for a series of weekly Racine Spelunking stories in which our Bobby Tanzilo explores some Racine County gems. Racine County Courthouse, 730 Wisconsin Ave., stands almost like a monument in the center of downtown Racine. The tallest building in the county sits, monolithic, surrounded by open space, accenting its dominance on the skyline. As you near it, the numerous carved reliefs on the building's exterior come into focus and you realize how beautiful this striking modern Art Deco structure really is. 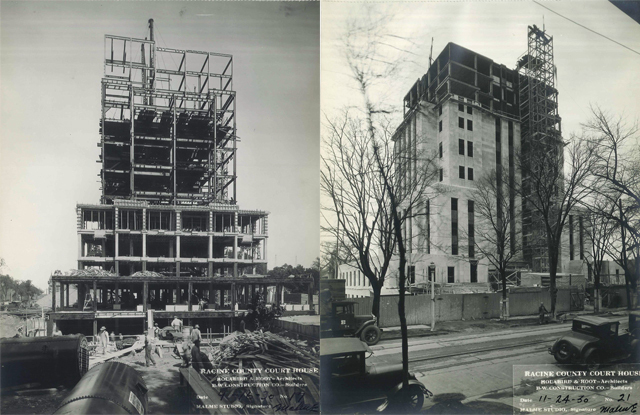 "Prominent Chicago architects Holabird and Root designed this 11-story edifice, Racine's most imposing landmark," noted the Wisconsin Historical Society's Architectural Inventory. 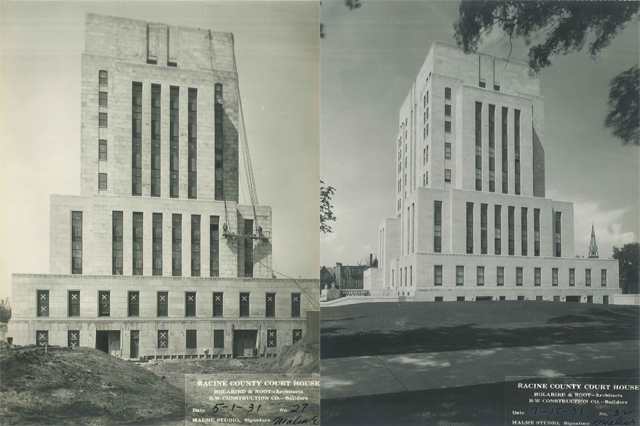 "With two low projections from its massive body, the courthouse looks a bit like a cubic sphinx. The symmetrical, stepped-back massing and vertical emphasis reflect the geometry of modernism. "This building, stripped-down and solemn, includes only minimal ornamentation on its smooth Bedford limestone walls, with stylized leaves and shields at the roofline and stylized civic symbols capping the pilasters." The Chicago architectural firm of Holabird & Root, which designed the courthouse, knew a thing or two about stunning architectural statements. Founded as Holabird & Simonds in 1880 by William Holabird and Ossian Cole Simonds – who had worked together under architect William LeBaron Jenney – the firm underwent some changes (Holabird & Roche designed a number of Milwaukee projects, including, most notably, the Plankinton Arcade in 1916, and the Hotel Schroeder/Hilton City Center and an addition to Cudahy Towers in 1928. 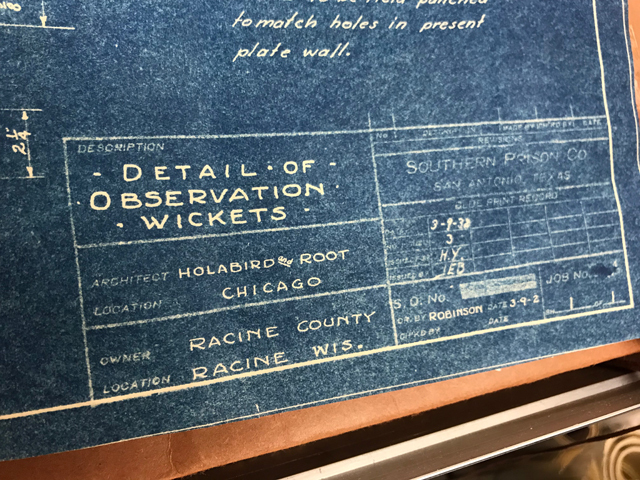 In the 1920s, both Holbird and Martin Roche had passed away and Holabird's son, John, and John Wellborn Root took over, renaming the firm Holabird & Root (and it still operates today under that name despite the fact that there are no longer Holabirds or Roots working there). This is the team that designed A.O. Smith's stunning – and stunningly sad these days – laboratories building. 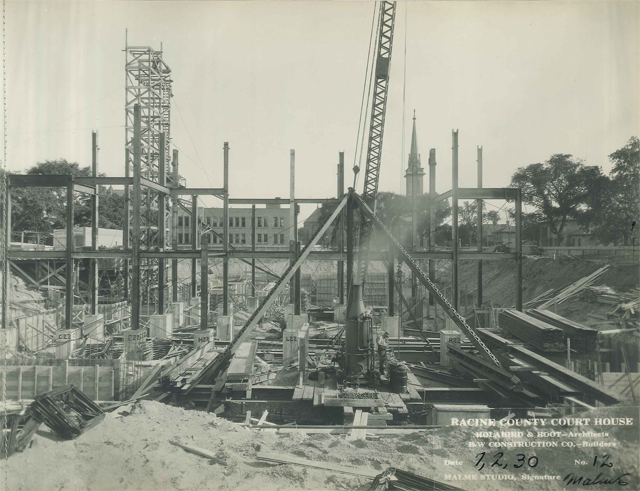 In 1930, Holabird & Root designed the new Racine County Courthouse, which would be the third courthouse building. The first, located on what it today called Monument Square, a couple blocks to the northeast, was a Greek Revival structure built in 1839 and moved twice. First, it was shifted slightly to accommodate the construction of its replacement in 1877 – a $40,000 Second Empire building (pictured at right) designed by Milwaukee's Henry C. Koch, and it kicked of a spree of courthouse-building for the architect, with projects in Dodge, Jackson and Dodge Counties as well as in Lake County, Illinois. Later, the old building was shipped out to the west side of Racine for reuse as a factory. The Koch building was described by William O'Brien, in his thesis on the architect, as "a pastiche of Greek Revival and Second Empire forms and elements ... a three-story block with a low hipped roof and shallow, gabled cross wings. ... With its brittle linearity and stylistic mixing lacks the formal and ornamental coherence of later designs, its looming tower and complement of projecting pavilions initiates the scheme of Koch's courthouses of the next several years." 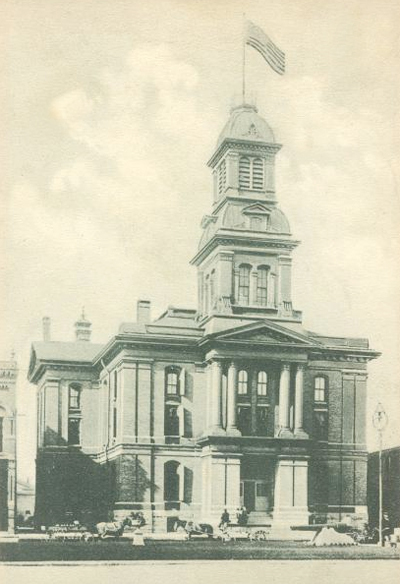 The Koch building was expanded in 1914 but still proved inadequate and was replaced with the current courthouse on the site of the old Racine High School. Koch's courthouse was then razed. The new building, quite a statement of modernism in itself, was part of a civic building boom that changed the face of downtown Racine, and included a new City Hall (designed by Norwegian immigrant and Racine resident J. Mandor Matson) and a new Classical Revival post office designed by James Wetmore, who worked for the Treasury Department and was not, in fact, a professional architect. All three projects opened during a July 1931 "Dedication Week" extravaganza in Racine. 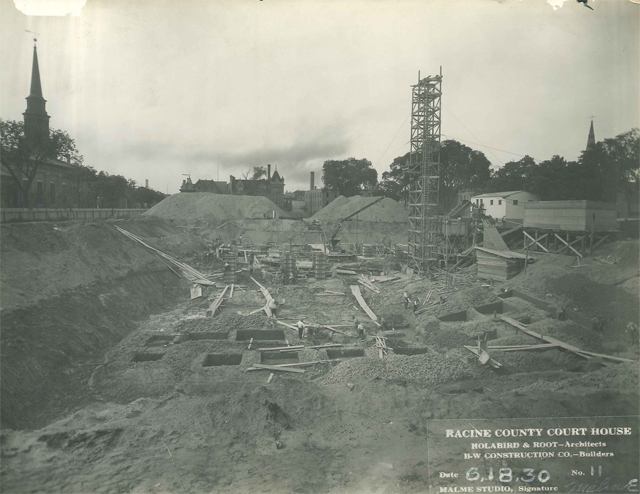 "This week is an outstanding one in the city and county of Racine," wrote the Racine Journal-News at the time. "One in which the people of the entire county are joining in ceremonies and festivities which mark a most important step. There have just been completed three of the most beautiful and imposing administration buildings, costing in excess of $2,000,000. The building is faced in Bedford limestone from Bloomington, Indiana, and a train load of stone – 74 cars with 40 tons per car, for a total of 2,960 tons – was used. 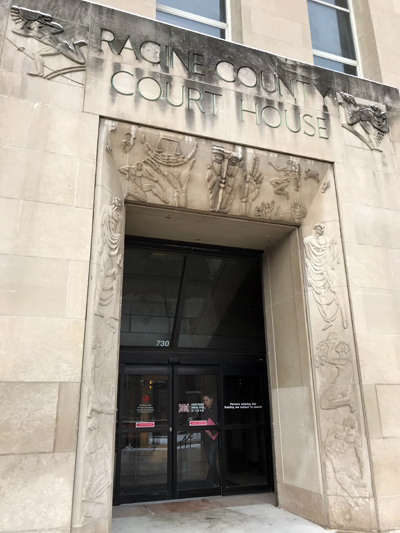 From a distance the Racine County Courthouse, looks a bit stark, and you have to get a close-up view to appreciate the details, like Swedish sculptor Carl Milles' reliefs, which were his first American commission. Though Milles isn't a household name here, his profile is much higher in his native Sweden, where his home is now a museum. Milles was hired by Holabird & Root and he, in turn, tapped Magnus Jonson of Frankfort, Indiana, to do the carvings above the east and west entrances. Chicago's Louis Terebesy and Frankfort's Ivan Scott assisted. 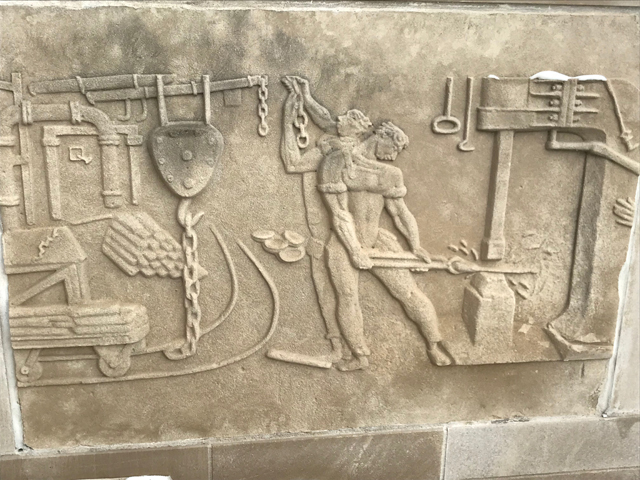 "Milles' spectacular bas-relief panels in the entry plazas and recessed entryways, which adopt the heroic Social Realism style, popular in the 1930s," according to the WHS inventory entry. "These depict people laboring, struggling through life stages, and grappling with nature's elements." The diversity of figures is intriguing and there are quite a lot of them; enough that you could spend a long time checking them all out and trying to decode their meanings. There are a mason, a carpenter, a mother and baby, a prophet, a deity, zodiac signs, depictions of marriage, schoolchildren and on and on. In terms of usage, the 11-story building has undergone changes. The top floors were originally home to the jail, but now there are offices there. 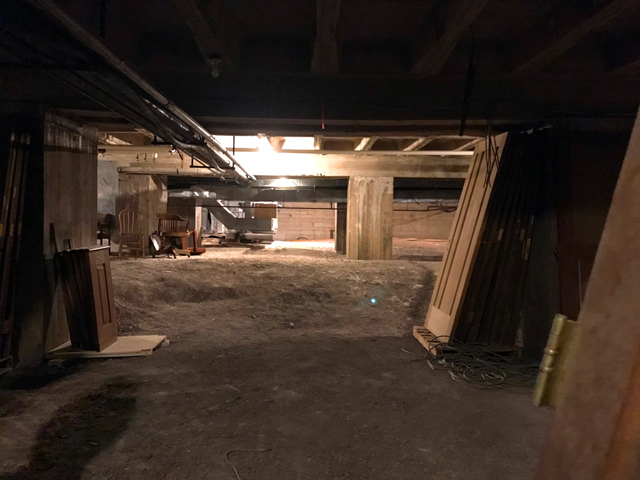 The basement was home to the Sheriff's Department, but that, too, has moved off-site. 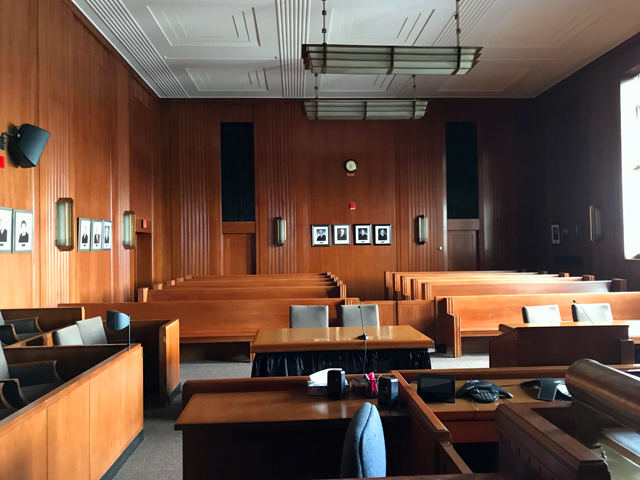 There are roughly a half-dozen courtrooms of varying sizes, trimmed in walnut, butternut, oak and mahogany, and with long, sleek brass and glass Moderne hanging light fixtures. One smaller courtroom, used mostly for hearings, was created on the first floor in an area that was once offices. Considering the monumentality of the exterior, I was surprised to see how modest the lobby is in terms of size. 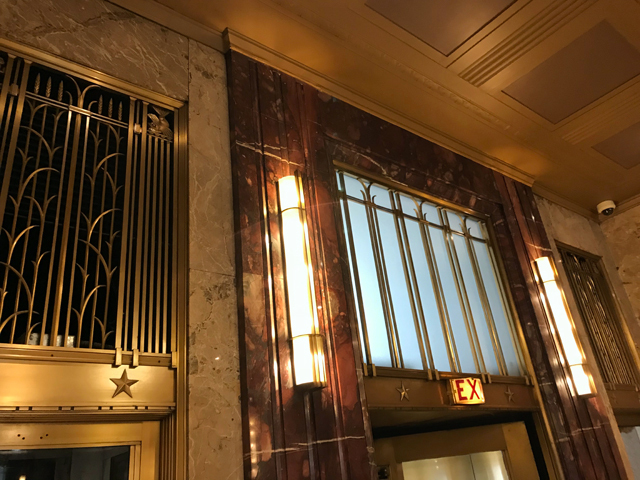 But what it lacks in volume it more than makes up for in beauty, with beautiful adorned brass elevator doors and heating grates, granite and marble walls and, as in the courtrooms, absolutely amazing Art Deco light fixtures. There are elaborate terrazzo floor designs and stunning hand-lettered signs throughout the building. Racine County Director of Information Technology John Barrett leads on me on a tour of the building, but our first stop is to see the amiable and extremely knowledgeable Karl Jeske, who has years of experience as Racine County's superintendent of maintenance and knows this building inside and out. Jeske appreciates the beauty and history of the building and is keen to share roll after roll of blueprints of every aspect of the building. 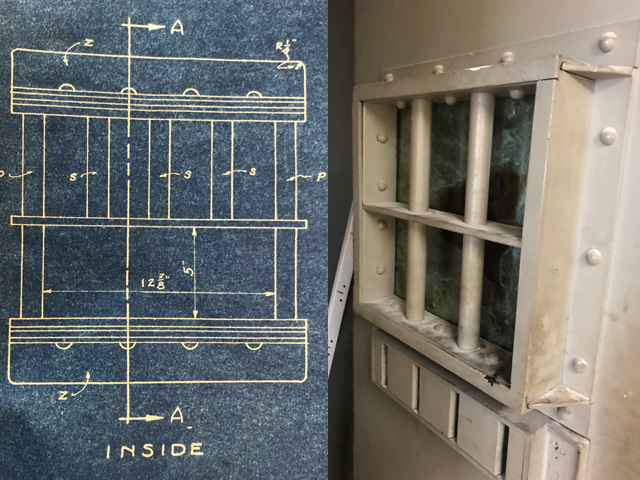 Jeske's office has an impressive collection of original plans and construction photographs and it's amazing to see how Holabird & Root drew every detail, right down to the bars in the "observation wickets" (holding cells adjacent to the courtrooms). Jeske also has an interesting collection of items he's found during renovation projects in and around the building. There's everything from a rusty old horseshoe to a brick signed (name and address!) in 1927. Despite the fact that the building is rich in lavish details, Jeske says there used to be much more. But at some point, before his time, when a major renovation was undertaken, many of the objects were tossed. 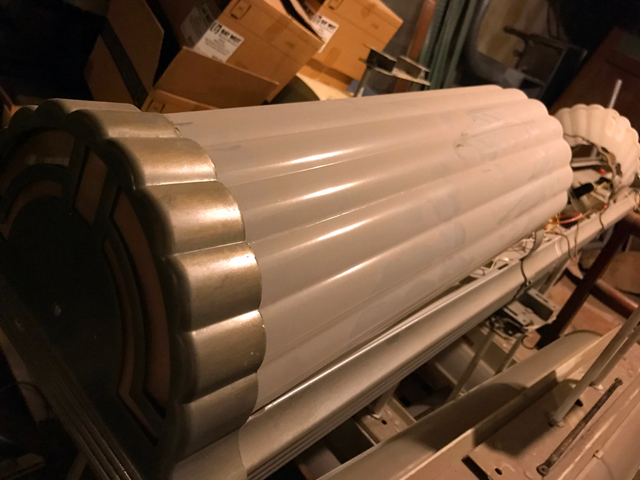 It was the job of the contractors to deal with the items pulled out and no one thought to preserve them at the courthouse. 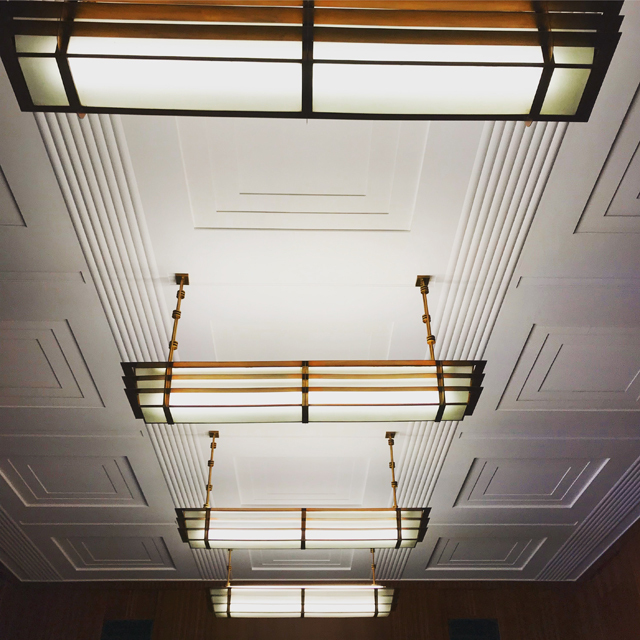 "Brass light fixtures and marble panels just went walking out the door," he says. "I imagine a lot of really nice cabins up north with marble floors and brass lights." Fortunately, Jeske arrived soon after and since he got there, nothing has left the building. Now, he keeps everything in the building's sub-basement, 33 feet below street level, which is a bit like a museum. There are original padded courtroom chairs, heavy clerks' desks, irreplaceable glass light fixture shades, heavy brass clocks. 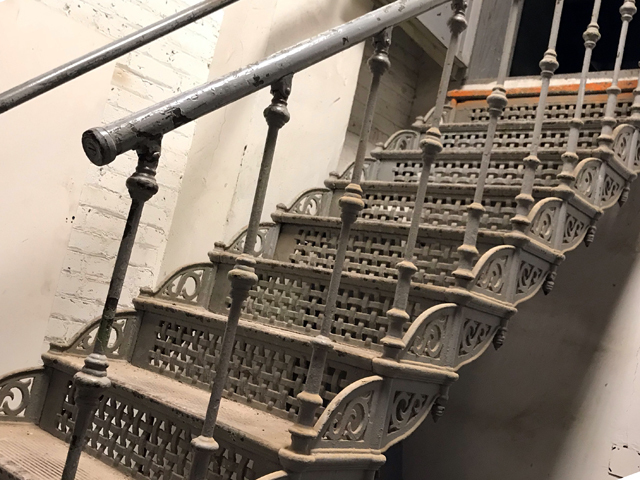 As we walk through this unexcavated part of the basement – accessed by a gorgeous cast-iron staircase – with wildly undulating dirt floors, we pass stacks of solid hardwood doors of a dimension you rarely see anymore. "Each of these doors is probably worth a couple thousand dollars," Jeske says. "You can't even get them anymore. You'd have to have them specially made." Jeske allows employees to use this stuff in their offices, if they'd like, though he admits few will choose a heavy wooden chair nowadays when you can easily and inexpensively purchase a comfortable adjustable office chair. But Barrett, who, like Jeske and I, has an appreciation of history, selected two different styles of vintage clocks for his office, which has a south-facing view that includes Frank Lloyd Wright's instantly recognizable SC Johnson Research Tower, which we'll visit soon as part of this series.